Unlike the Canon PowerShot G11, the S90 is an ultra-compact camera. Measuring 100×58.4×30.9mm and weighing 175g, it is small enough to fit inside a jacket pocket. With a discreet, simple, yet stylish design, it isn’t a camera you would be embarrassed to be seen with at a party. However, the body isn’t all style and no substance, as the front and rear of the camera are made of metal and feel solid and well built. That is not to say there aren’t a few peculiarities when it comes to handling. For example, when I first picked the S90 up and tried to press the shutter button, I missed by almost a centimetre. I think this button is set too far to the left of the position where I would naturally expect it to be. Passing the camera around to a few people at AP confirmed that it wasn’t just me who thought this because most of the people who handled the camera instinctively pressed the top of the Mode dial rather than the shutter release. Similarly, the neat pop-up flash rises from where I naturally hold the camera with my left hand, and it took me by surprise when the automatic flash popped up for the first time. For the most part, though, these small ergonomic issues aren’t a problem once you have used the camera for a while, and certainly shouldn’t put off potential purchasers. In fact, there is one handling feature of the S90 that I wish was included on the PowerShot G11 – the control ring. This is found around the base of the lens, and feels just like an aperture ring. In fact, when the camera is in aperture priority or manual exposure mode, the control ring can be set to change the aperture. This is a nice touch, and really adds to the camera’s handling. Aperture control isn’t the only function of the control ring, as it can also be used to control the EV compensation, ISO sensitivity setting, stepped zoom setting, manual focusing and the white balance shift. Using the ring to control focusing, zoom and EV compensation feels very natural if you are used to handling a DSLR. There is a button on the top of the camera to select those features you wish the ring to control. I changed this according to what I was photographing and the exposure mode I was using at the time. Generally, I had it set to control aperture or EV compensation. As for the rest of the camera’s handling, the S90 is largely the same as most other current Canon compact cameras. A mode dial controls the shooting mode, while buttons on the back provide direct access to the most commonly used functions, such as turning the flash on and off. A scroll dial is located on the back of the camera, which allows settings such as shutter speed and ISO sensitivity to be quickly scrolled through and selected from the on-screen menu. In all, the range of dials and buttons makes it easy to select all the various controls and settings, regardless of whether they are accessed directly or via one of the camera’s on-screen menus. 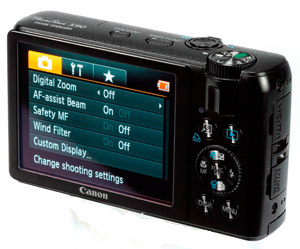 However, as it has more buttons and controls, I prefer the handling of the PowerShot G11.